The gigantic rocks of Meteora dominate imposingly in Kalambaka between the mountains of Koziaka and Antichasion. Nature reveals all its greatness for centuries now, while it constitutes a unique beauty, geological phenomenon and an important monument of Orthodoxy. Meteora have been characterized as the second Mount Athos and continue the monastic tradition for six centuries. From the 24 monasteries today only six are occupied while the remainder 15 are uninhabited. Today, the tradition of Orthodoxy is continued by the Holy monastery of the Great Meteoro, the Varlaam monastery, the Holy Trinity monastery and the Saint Nicholas Anapafsas monastery which are male dominated monasteries although Saint Stefan and Roussano are female dominated monasteries. U.N.E.S.C.O has characterized the Holy Meteora as a monument of Humanity that has to be maintained. 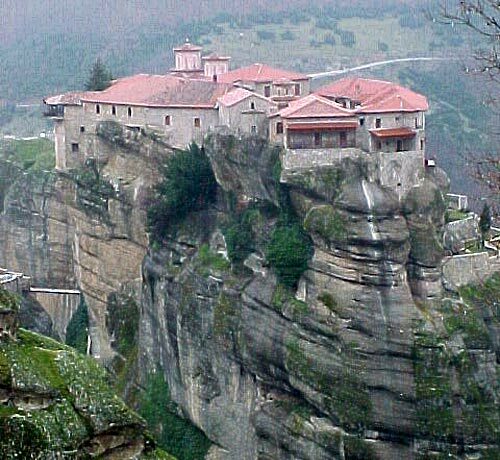 So the monasteries of the Meteora are included in the Monuments of the world cultural Heritage.